The scattering of the Jewish people from the land of Israel throughout the nations of the world was a result of their disobedience to God’s law and their rejection of the Messiah. The first dispersion, as mentioned in a prior article, was the Assyrian and Babylonian captivity (721 and 586 B.C., respectively). The reason for this, as unanimously witnessed by both the preexilic and exilic prophets, was Israel’s gross idolatry and apostasy from the Lord (Jeremiah 7, 9; Isaiah 1-6; Ezekiel 8-11, et al.). The second dispersion occurred for Israel’s rejection and mistreatment of the Messiah who came to redeem them and offer the Messianic kingdom (Luke 19:41-44). But in the beginning of their national history, God foretold all these things would happen as a warning to the nation through Moses, right before the people of Israel were to enter the Promised Land. In Leviticus 26 and Deuteronomy 28-32, Israel’s covenantal obligations as the Chosen Nation of God are spelled out by the Lord. The blessings that would accrue to their obedience are given and conversely the curses that would fall on them if they chose to walk contrary to the Lord and not obey Him were clearly spelled out to the nation. A cursory reading of these pivotal chapters at once reveals a precise and accurate prophetic portrait of the history of the Jewish people that has been fulfilled to the letter for the last 3,500 years! This scattering of Israel to all the Gentile nations of the world would serve as a sign for all to see God’s reproach and displeasure for their disobedience to Him. Now in our day with the recent partial restoration and regathering of the Jewish people back to Israel, God is in the process of answering this very prayer. Throughout the long Diaspora, God promised that He would preserve the Jewish people as a distinct people among the Gentile nations so that by and large they would not be assimilated or be expunged by them. The Assyrians, Babylonians, and the Romans all invaded Israel and conquered the Jews and subsequently led them captive away from the land to be scattered throughout the nations. After the dispersion of 70 A.D., the Jewish people were to live without a homeland for almost 2,000 years. 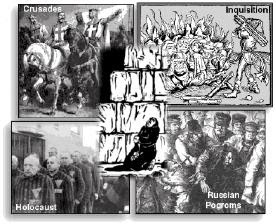 “To a Jewish person, Christ conducted the Crusades, invoked the Inquisition, and prompted persecution of Jews over the last twenty centuries. To a Jewish person, Christ is the first part of the term used by those who accuse Jews of deicide: “Christ-killers” (“You Bring the Bagels, I’ll Bring the Gospel,” p. 94).